Connie and I on a visit to Belleville, PA several years ago found a quilt called the Georgetown Star which was modified by an Amish lady. We both loved the quilt so we purchased it and have it in our house here in Fulton Co. 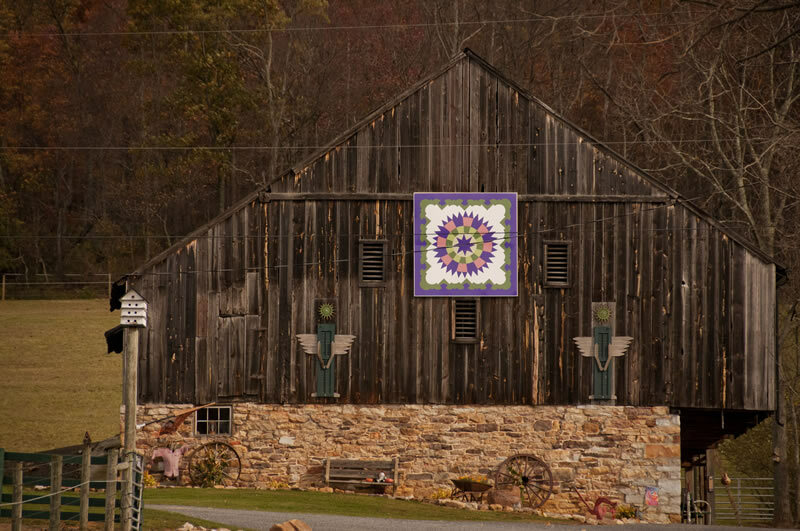 When we heard about the barn quilt trail being formed we thought it would be great to have a replica of the cloth quilt turned into a barn quilt and placed on our historic barn. This barn was built in 1855 and in 1931 my Grandfather; Mr. Hayes Edward Richards purchased the barn and property in 1931 to be used as a dairy barn, of which was the original use and design of the barn. The barn is constructed of native chestnut, oak and hemlock. In 2008 electric was installed in the barn and it has since been converted into an equipment storage, chicken house and antique museum. The barn, aAll crafted and maintained by my lovely wife Connie, tends to the barn, museum and the chickens with the greatest of pride, love and caring.